Grout Shield Keeps Your Kitchen Tile Looking Fresh And New! Tired of your kitchen floor? Do you want to bring a fresh look into your bathroom without having to spend hundreds or thousands of dollars on renovations? There is a way you can breathe new life into your tile surfaces without having to remove the grout at all. 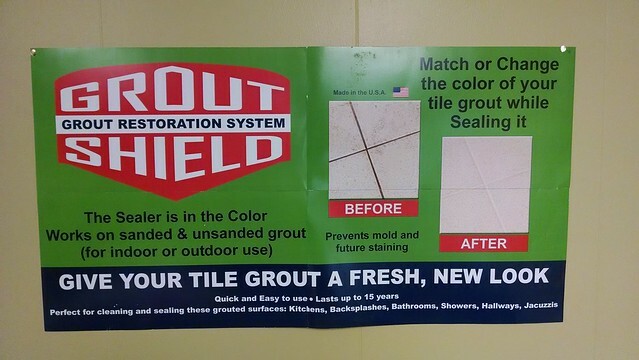 Now you can change your grout color by simply cleaning and sealing your existing grout! Our easy to ise products make it simple! Grout Shield … The World’s Best Grout Products! Unfortunately because grout is such a porous material, every time something is spilled or dirty mop water is passed over the tiles it gets absorbed into the grout. Unsealed grout soaks up liquids like a sponge!It doesn’t take long before the grout lines are dingy and dark. Applying grout sealer will prevent stains and dinginess that comes with age. Since the grout sealer can be made in any color you can match your existing grout or simply change the grout to the shade you want, you are changing grout color when you apply the sealer. So if you want to bring back that bright white you can, or if you prefer, you can also change things up a little by changing the color of your grout. You can get a whole new look and feel to your kitchen or bathroom for a lot less than the cost of a new floor! The sealer will be ready to be walked on within just a few minutes and completely cured in forty eight hours. When spills happen in the future, a simple touch up will get it back to the clean, and looking like new in no time at all.